"Governor General's Northern Tour. 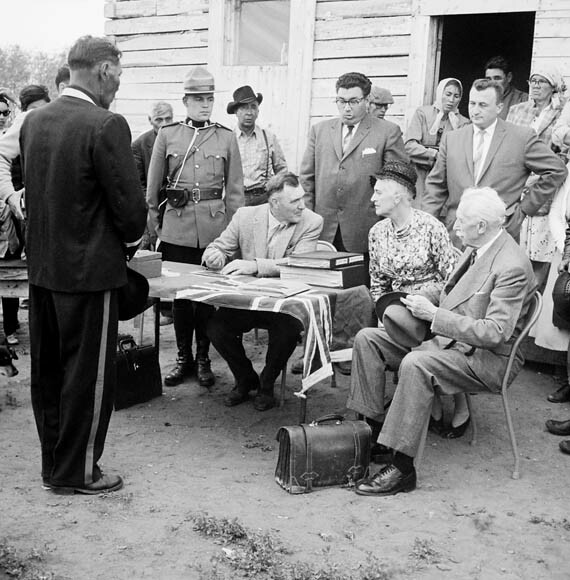 Governor General Georges P. Vanier and Mrs. Pauline Vanier seated (right) with Indian Agent S.C. Knapp during payment of treaty money to Indians (1961)." Source: Library and Archives Canada, R1196-14-7-E.
“Governor General’s Northern Tour. Governor General Georges P. Vanier and Mrs. Pauline Vanier seated (right) with Indian Agent S.C. Knapp during payment of treaty money to Indians (1961).” Source: Library and Archives Canada, R1196-14-7-E.
Human health and quality of life are inseparable from the environment in which we live. For Aboriginal peoples in Canada the history of colonialism, the control by one country over another area and its people and resources, informs both environmental and health issues. Reserve location and size, resource availability or extraction, pollution, and climate change are all environmental factors that influence Aboriginal peoples’ health and are products of colonization. Health challenges facing many Aboriginal communities in Canada that are historically rooted in colonization, include the spread of infectious disease due to overcrowded or insufficient housing, depression and other mental health and social issues linked to abuse and the legacies of residential schools, and childhood obesity and rising Type 2 diabetes. Aboriginal peoples are often left out of discussions surrounding their own communities’ health, or they are marginalized by bureaucrats. This exclusion and marginalization does not mean Aboriginal methods do not work or exist, or that Aboriginal communities are not trying to find their own solutions. The connections between health and the environment are more evident for some Aboriginal communities in Canada than others. Northern communities are bearing the brunt of climate change in Canada, with direct impacts to human health. Increased temperatures have led to thinning ice, a shortened ice season, reduced snow cover, melting permafrost, increased coastal erosion, and changing wildlife and plant distribution. These changes have increased accidental deaths, mainly caused by falling through melting ice; reduced access to food sources as winter ice travel is no longer possible; decreased access to fish stocks due to ice break-up, leading to nutritional and socioeconomic vulnerability; increased infectious diseases as more and different insects enter the Arctic environment and new parasites are able to live in warmer water; and decreased infrastructure stability as permafrost melts and sea levels rise. Southerly communities have also experienced environmentally influenced health concerns. Many aboriginal communities have histories of resource extraction, some with considerable pollution and environmental degradation that have contributed to ill health for Aboriginal people. When trying to understand Aboriginal environment and health issues, historical context is crucial. A 2008 StatsCan report argued that Aboriginal women have higher rates of obesity than non-Aboriginal people, because Aboriginal women eat junk food and drink sugary drinks. This report should be criticized for many failings, but the lack of historical context is alarming. Attempting to diagnose health problems for an ill-defined population of individuals, removed from their community contexts and histories is useful to no one. Similarly, the United Nations’ “special rapporteur on the right to food” recently criticized a Canadian food subsidy program for benefiting retailers more than the Aboriginal communities they service. While the report may make some sound arguments, its failure to include northern Aboriginal communities’ concerns about attempts to curb seal hunting reflect the need for historical context and community-driven approaches. These are situations in which history can inform issues at hand and allow a respectful place for dialogue about solutions to begin. On this episode of the podcast, we dive into the history of health and environmental issues among the Aboriginal peoples of Canada. Speaking with a diverse panel of expert researchers from across the country, we explore several key issues in this history, including treaties, natural resource exploitation, community-based research, and intergovernmental relations with Aboriginal nations. Furgal, Christopher and Jacinthe Seguin. “Climate Change, Health, and Vulnerability in Canadian Northern Aboriginal Communities.” Environmental Health Perspectives, vol. 114, no. 12 (Dec., 2006), 1964-1970. Kelm, Mary-Ellen. Colonizing Bodies: Aboriginal Health and Healing in British Columbia, 1900-50. Vancouver: UBC Press, 1999. Kilpatrick, Sean. “Health Minister acknowledges Northern food issues, but maintains UN criticism.” Globe and Mail, May 23, 2012. Lux, Maureen K. Medicine that Walks: Disease, Medicine and Canadian Plains Native People, 1880-1940. Toronto, ON: University of Toronto Press, 2001. Thorpe, Jocelyn. Temagami’s Tangled Wild: Race, Gender, and the Making of Canadian Nature. Vancouver: UBC Press, 2012. Kheraj, Sean, Stacy Nation-Knapper, and Andrew Watson. “Episode 32: Histories of Canadian Environmental Issues, Part II – Health and Environmental Issues in Aboriginal History” Nature’s Past. 29 October 2012.